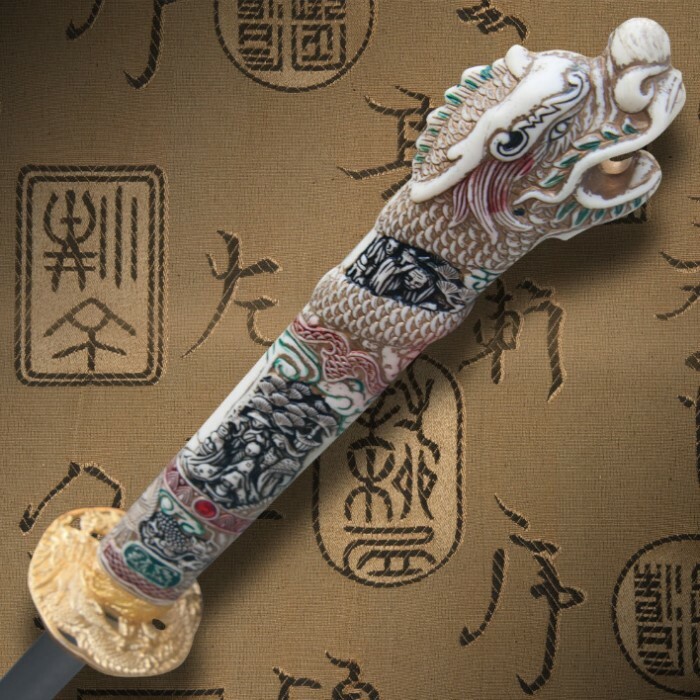 This piece is recognized by sword collectors from all over the world. 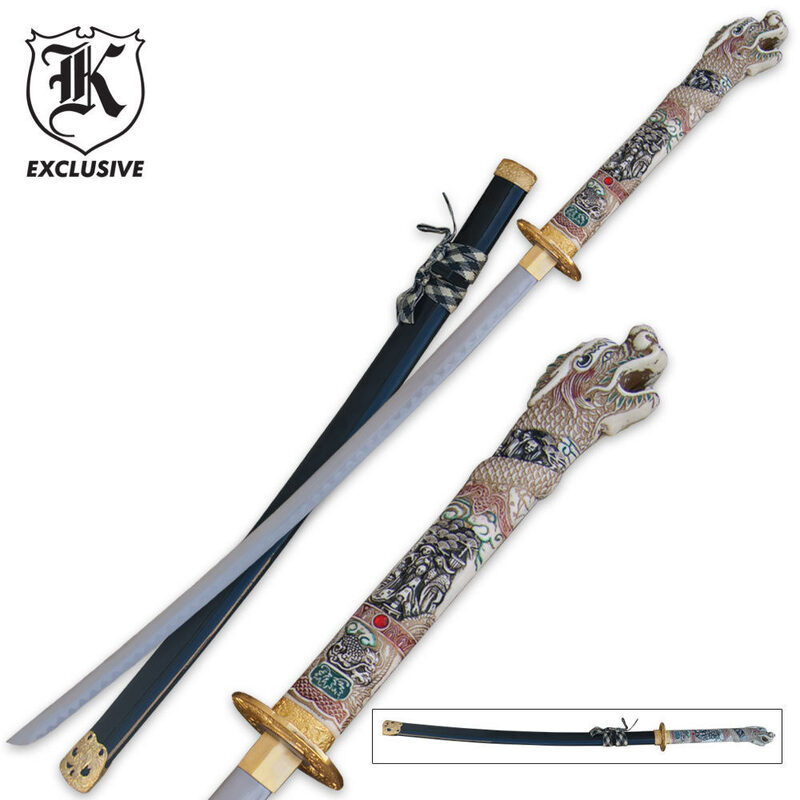 This sword features a synthetic dragon head handle with hand painted details, accented by a brass-plated guard. Includes a black high gloss wooden scabbard with brass plated end cap. 26 in. blade, 38 1/2 in. overall. Once again Budk hasn't let me down at all. I love this piece. I had ordered the other before this one and once again was amazed of the beauty of this sword. A great piece for my collection. Absolutely love it!! A work of art! I am very proud to display it, and show it off!! I see some of the negative comments on some of the swords for less than $30, and they crack me up!! Seems to me they are expecting a lot for swords that inexpensive!! I like this sword but it could be alot better the paint on the handle is kind of ridiculous. The blade is a bit to thin and the fact that you can't disassemble the sword is a very big negative. But overall This sword is a good trainer but can't hold up to a sword that's the real deal. However it does fill the void left by the discontinuation of the united cutlery highlander swords for only 1/10th the price. My advice to BK: Make the blade much thicker. get rid of the paint and make it look like distressed ivory (like it should be) get rid of the fake ruby and glue and just use pins (instead of pins and glue) Offer the sword in damasks steel. I bought this sword to complete my dragon head display and i was pleased with the art work on the handle,the blade was dull but this piece was only intended for display not use.the saya was well fitted for the sword and the gold accent's add an extra detail that is very well noticeable.For the price I paid for it,it is a good piece to add to my collection,however i'd like to see the saya (scabbard)come in different colors,as i would purchase more of them if they came in red,blue,burgandy,etc.I have an 8 tier display and if they came in 8 different colors i would have filled the rack with them. My Dragon head sword is a true work of art. The blade is polished to perfection. The sword is well balanced and easy to handle. It is one of the best things I ever bought. Pros, good steel, good handle. Cons blade is far to thin to be functional against another blade, but for practice or walk through it would be fine. The red green gold. blue paint and ruby is a little tacky. So is the cheep looking furniture. If they made this same sword in just white with real bronze/ brass furniture as well as double the thickness of the blade. I would gladly pay over 100 dollars for it. That said it's worth every penny. It also comes very dull. Unlike most of the reviewers, I am a dealer. I am also a collector. It was in excellent shape when it got here, fast service. It was sharp enough to sell that day. Very fine detail. I don't reorder blades that sell, in case there was a price increase but this one is different. If your blade is not sharp enough for you, then sharpen it. there are several web sites with instructions/pictures on how to do it. I hand out 3 pages to every one that buys a sword. This blade is not made to chop cane or sticks. Buy it and display it proudly and listen to your friends grit their teeth. I am greatly impressed with this item. It is a very strong blade and is more durable then I thought it was gunna be, which is a great. Great decorative sword, definitely worth the price. Looks great, the blade is very tall although not as sturdy as I was hoping for. But you get what you pay for, so if you end up buying this don't go swinging it around. The sword is very durable it must be full tang; but the sword was completely dull other than the tip.